Last November, Erik Lacson and I accepted an assignment from Cebu Pacific’s in-flight magazine, Smile. Our job was to document a Kulinarya Tour of the historical town of Taal for their January issue. Enjoy. I am a foodie, mostly passionate but occasionally obsessed with food. I’ve been lucky to have savored the flavors of the world. But lately, I’ve been feeling the need to explore the country I call home. What better way to learn about the diversity of the Philippines than through its food? So I’ve booked a trip to Batangas, a kulinarya tour of the heritage town of Taal. Every food tour should begin or end in a market. Our guide, Dindo Montenegro, takes us to our first stop, the Taal Public Market. After navigating though an unusual mix of shops, we reach the stall of Aling Rowena. Aling Rowena owns a typical turo-turo eatery. 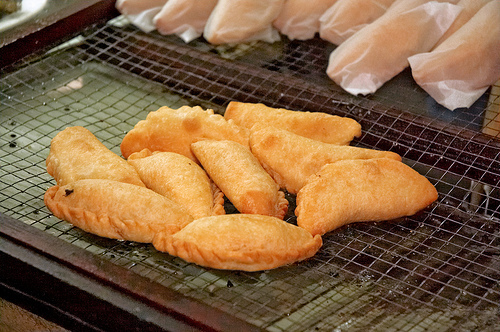 She is most famous for her special empanadas, deep-fried, half-moon shaped pastries stuffed with ground pork, root vegetables and vermicelli noodles. She admits that there is nothing amazing about her fillings but what makes her empanadas unique is her pastry dough. Once fried, it forms into a shell so buttery and soft, it delicately dissolves in your mouth. 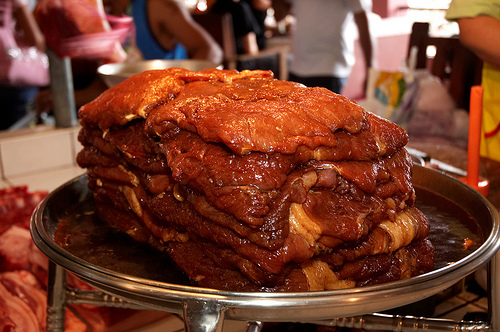 Batangas is famous for its beef. But walking through the market’s meat section, you’ll notice that they are equally enamored of their pork, specifically their Tapang Taal, thin slices of pork, marinated in a mixture of soy sauce, kalamansi and lots of garlic. Every butcher’s table proudly showcases their own version of tapa, presenting the marinated slabs on elevated stainless steel mounts as makeshift fly swatters spin around each display. Beside the beef, Batangeunos is known for their coffee, barako. 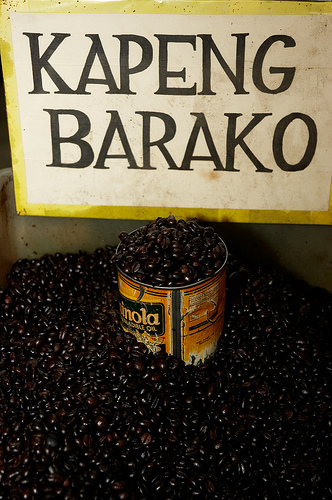 A variety of the Liberica coffee, barako was once a major cash crop in the province. But today, the strain is struggling to find to way back to popularity. In the market, barako exudes a memorable aroma of dark chocolate with bitter caramel notes. Barako’s flavor is so strong that natives serve their coffee saccharine sweet. It’s time for an early-morning snack. 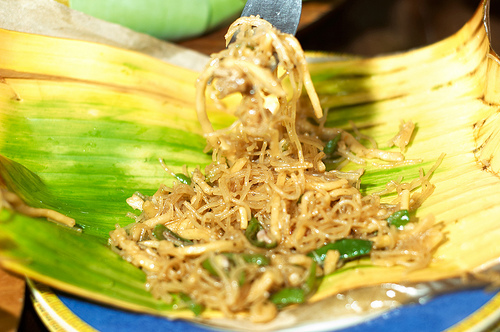 So we meet Mang Biko whose name is synonymous with pancit. 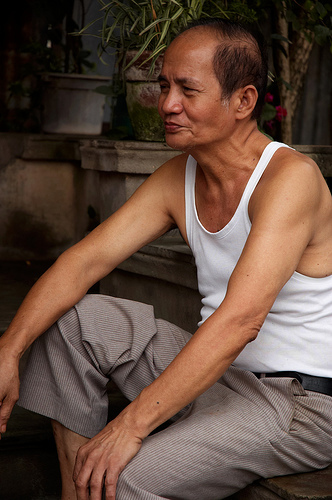 Every morning for the last 50 years, Mang Biko wakes up at 4 a.m. to cook one thing: pancit, a simple noodle dish of vermicelli and egg noodles, shrimp and sliced chicken. From the dark basement of an antiquated house, he stir-fries pancit in a large wok over a high flame while his assistants feverishly prepare ingredients and pack his cooked noodles in cone-shaped containers of banana leaf and brown paper. “Hindi ko nga alam kung bakit sila pumipila,” Mang Biko says in puzzlement. He has no special techniques or secret ingredients. But his customers keep coming back, forming a line that would put many fast food chains to shame. Customers who can’t wait to tuck into his steaming hot noodles are given a wooden skewer which is then ingenuously broken into a makeshift pair of chopsticks. Just before 9 a.m., all cooking stops. Mang Biko has just cooked nearly 80 kilos of pancit. Late customers have been known to plead with him to cook more. But he respectful apologizes and asks them to come back tomorrow. Mang Biko claims it’s because he getting old. But I think it’s because he knows that the hungry faithful will always come back, wanting more of the pancit only he can make. Much thanks to Maya Calica, Erik Lacson, Dindo Montenegro and the staff of the Southeast Travel Corporation. For more fun-filled articles and travel suggestions from Smile, please click here. Culinary tours to other destinations are also available. I read this article on my way back from Manila. Made me want to fly back and get myself some tapa and empanada. That platter of tapa look absolutely delicious! Thanks for reading both pieces, Katrina. I had almost forgotten about the dessert article. Thanks for reminding me.